Sunny Day Publishing, LLC, 9780982548080, 184pp. Not only will this cookbook appeal to veterans of the Paleo lifestyle and foodies, but simple enough for those new to Paleo or those a little timid in the kitchen. It's also a fantastic resource for those allergic to gluten and grains. Give Paleo a try your body and family will thank you for it. "Michelle has created a delightfully well-rounded cookbook that will help anyone new to paleo cooking feel right at home. There's a reason Cavegirl Cuisine is as popular as it is, people actually make the recipes." Jason Crouch, PaleoPot.com "Huge fan of Michelle's new cookbook. It's filled with simple and delicious paleo recipes that anyone can make at home. If you're looking to live a healthy lifestyle, Cavegirl Cuisine is a must have cookbook for recipe ideas to help keep you on track." Steve Liberati, Founder of Steve's PaleoGoods and Steve's Club National Program "If you think paleo meals are boring plates of meat and vegetables or have overly complicated recipes with long lists of ingredients that require hours in the kitchen, then Cavegirl Cuisine will make you think again. Michelle's recipes are clear and concise while the end results are sol delicious, you'll wonder why everyone doesn't eat this way all the time!" Patty Strilaeff, chowstalker.com "Take your taste buds to new places! 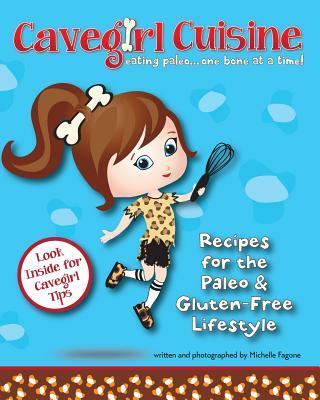 Every modern cavegirl needs a copy of Cavegirl Cuisine in her kitchen. This is not just another cookbook. Michelle will inspire you with her passion and creativity." Joanne, justeatingrealfood.com About the Author: Michelle Fagone is a mother of two young girls, an entrepreneur, and an avid Paleo food chef. She has a passion for healthy living and for sharing her unique insights via her recipes, her blog, and now her cookbooks. Despite being a southern gal at heart, her travel and food experiences as a Navy brat and current Army spouse, have enabled a unique appreciation for worldly flavors. While comfort is the basis for most of her recipes, you will often find a twist of exciting flavors and combinations which makes her recipes not only appealing to a broad audience, but uniquely delicious!